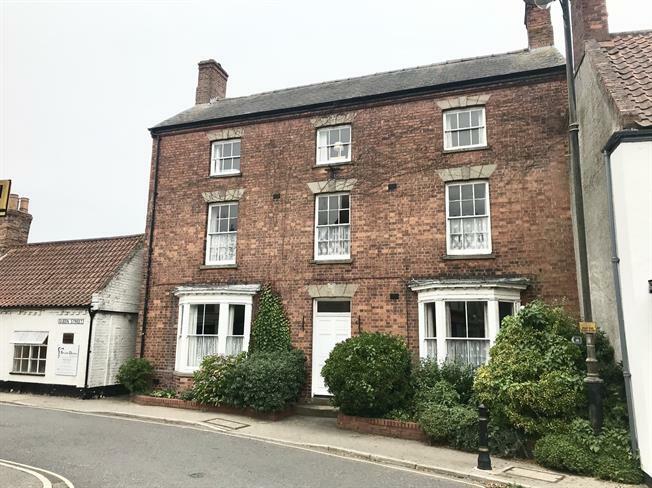 7 Bedroom Detached House For Sale in Spilsby for Asking Price £375,000. Beautifully presented throughout and offering over 4,000 sq. Ft of accommodation, this Grade II listed detached house is simply stunning. Having four reception rooms to the ground floor and a further cinema room in the basement, the property also benefits from a large breakfast kitchen, utility, bathroom, shower room and five en-suites!! The flexibility of the accommodation would suit an extended family or someone who is looking for the business potential of a B&B. Externally there is off road parking for at least two cars and a well presented and private rear courtyard style garden. An amazing property having history in the town dating back to the early 1800's. Single glazed window to front. Feature fireplace with inset open fire, radiator, ceiling light point, power points and TV aerial point. Single glazed window to front. Ornamental fireplace, radiator, ceiling light point, power points, solid wood flooring and serving hatch through to kitchen. Having ceiling light point, power points, TV aerial point, wall-mounted surround sound system and door to cupboard house central heating boiler and pressurised water system. Having ceiling light point and perfect for use as storage. Single glazed window to side. Space for washing machine, space for washer dryer, space for fridge/freezer. Ceiling light point, power points, stairs to first floor and original quarry tiled flooring. Comprising three piece suite of low level WC, single enclosure shower cubicle with wall-mounted thermostatic shower and wall-mounted sink. Radiator, ceiling light point, tiled flooring and extractor fan. Single glazed window to side. Radiator, ceiling light point and power points. Single glazed windows to rear. Comprising Heritage three piece suite of low level WC, freestanding bath with mixer tap and shower attachment over and pedestal sink. Radiator, ceiling light point and entrance door from landing. Single glazed window to side. Comprising three piece suite of low level WC, double enclosure shower cubicle with wall-mounted thermostatic shower and wall-mounted sink. Heated towel rail, ceiling light point, tiled flooring and extractor fan. Comprising three piece suite of high level flush WC, double enclosure shower cubicle with wall-mounted thermostatic shower and pedestal sink. Heated towel rail, ceiling light point, tiled flooring and extractor fan. Single glazed window to rear. Comprising two piece suite of low level WC and wall-mounted sink. Radiator and ceiling light point. Single glazed window to side. Comprising three piece suite of low level WC, double enclosure shower cubicle with wall-mounted electric shower and vanity unit with hand basin. Heated towel rail, ceiling light point, tiled flooring and extractor fan. Comprising three piece suite of low level WC, single enclosure shower cubicle with wall-mounted thermostatic shower and vanity unit with inset sink. Heated towel rail, ceiling light point, tiled flooring and extractor fan. Single glazed window to front. Radiator, ceiling light point and power points. Single glazed window to front. Radiator, ceiling light point, power points and built-in storage cupboard. Single glazed window to side. Comprising three piece suite of low level WC, panel bath with mixer tap and wall-mounted thermostatic shower over and pedestal sink. Radiator and ceiling light point. Single glazed window to side. Ceiling light point and perfect for use as laundry/general storage. Having restricted head height due to sloping ceiling. The front of the property has a low level brick wall border with mature shrubs and bushes as well as brick steps leading to the front door. The rear garden is of a 'courtyard' style and is low maintenance, laid to a combination of block paving, patio stone and gravel. Within the garden there are borders incorporating a variety of plants and bushes being fully enclosed by brick walling and timber fencing. There is off road parking for at least two cars with timber double gates leading into the garden where initially there is further hard standing for two more vehicles.